The Christian mission is to preach the gospel throughout the earth so all people might realize God’s grace. It is a daunting task, to preach to the whole world, but God’s people must be diligent, for we never know who is listening. When the time was right, God revealed his plan for salvation: the incarnation of his Word, who would dwell with humanity and save people from their sin. As angels announced the Christ child’s birth to shepherds, Magi were gazing at the stars in the night time sky. Such magi did not know God; they may or may not have heard the voice of the prophets. 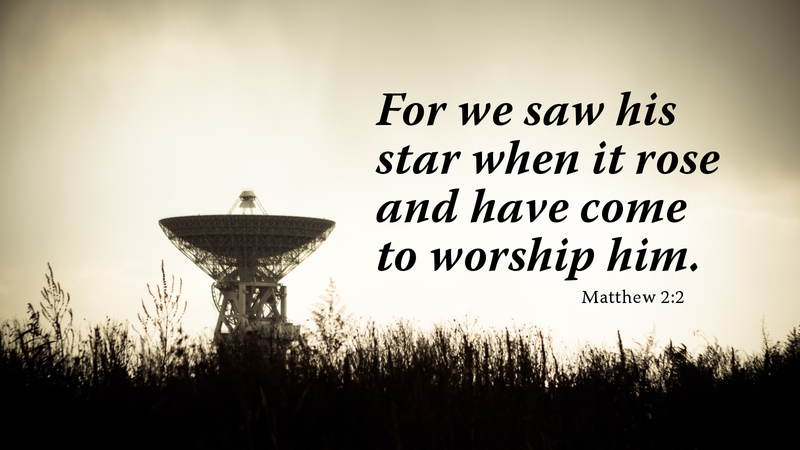 Yet, these pagans were looking toward heaven when God revealed to them the light of Christ through the light of a star. And so they followed, understanding there is one who is born King of Kings. As we proclaim Christ, we do not always know who is listening. As we show mercy and love to our neighbor, we do not always know who takes notice. But with the power of the gospel, the Holy Spirit works in the hearts and minds of those who are watching and waiting, that they may follow and believe. Prayer: Shine your light, O Lord, that all may see and follow. Amen. I have heard people say, “I wish I could have been there to see Jesus and his ministry.” Many of those same people are too timid to proclaim the word of God to those around them. Even if we just live our lives in service of our Lord, we are a witness to those around us. But, to have been at the feet of Jesus and be his disciple and learn from the master, would have been beyond comprehension. But, that also came with a cost. Serve as Jesus leads, not as many commands.